If any place could teach you a thing or two about Chinatown, it would be the Museum of Chinese in America. The newly expanded museum, now at 215 Center Street, has been an important part of the neighborhood since 1980, making 160 years of Chinese American history accessible to the public. 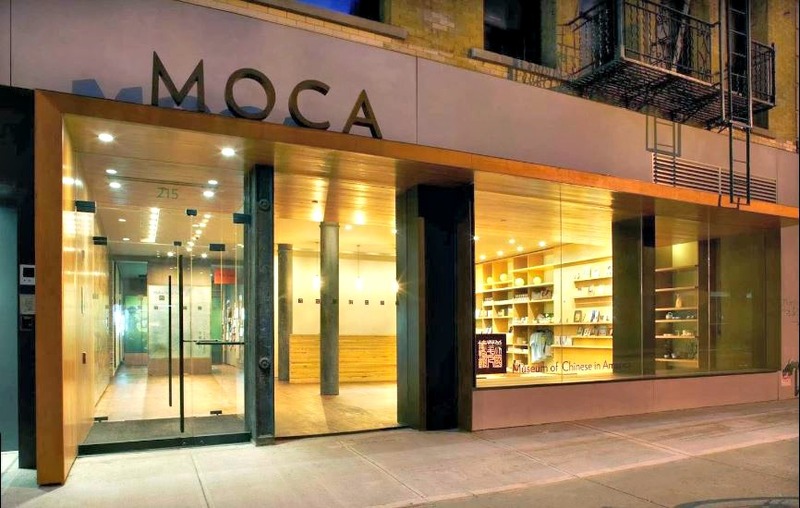 MOCA’s exhibits are always fascinating and thought-provoking and cover a wide range of Chinese American history. Upcoming exhibits include “SUB URBANISMS,” which explores the controversial conversion of suburban single-family homes into multi-family communities by immigrant Chinese casino workers in Connecticut, as well as a show of the work of architect Poy Gum Lee (more about him later). Ting’s Gift Shop is one of Chinatown’s oldest businesses still in operation. 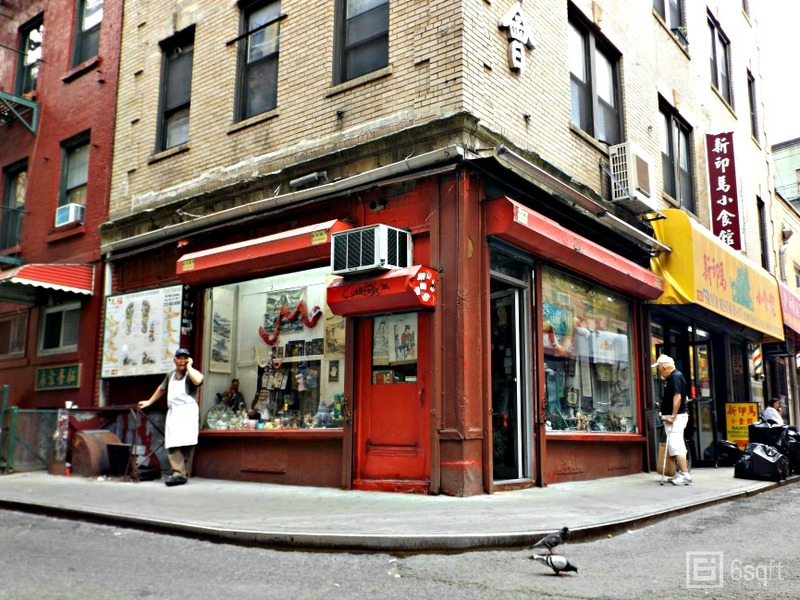 The little red shop has been at 18 Doyers Street since 1957 and is a favorite on tourists’ lists of places to see in the neighborhood. The shop’s fire engine-red facade draws visitors in, but what makes this place special are the piles of knickknacks that pack the store. From handcrafted dolls to Chinese finger traps, Ting’s Gift Shop has it all, including heroin once upon a time. Back in 1958 police found 10 pounds of the drug during a raid. Today, the gift shop supplies only wholesome merchandise to its many customers. 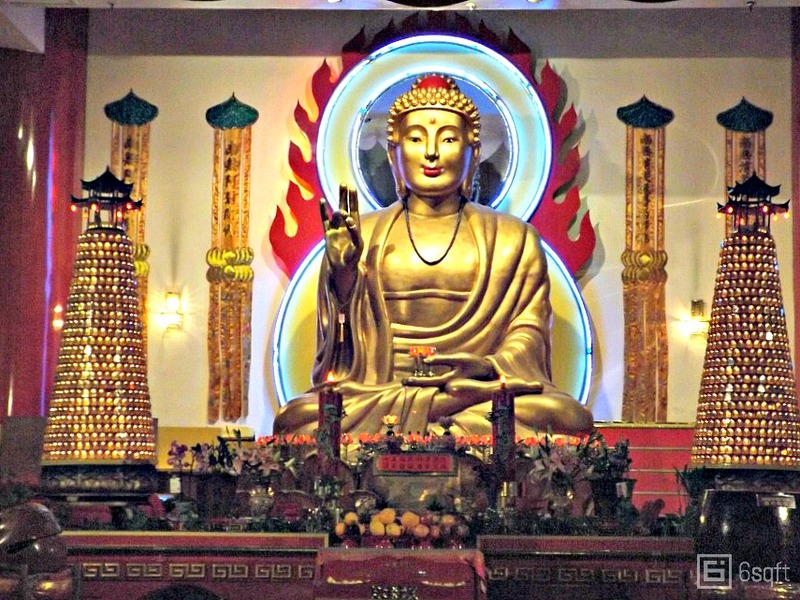 The Mahayana Buddhist Temple is one of the newest places on this list; nonetheless, with its colorful exterior and two golden lions guarding the door, it is one of the neighborhood’s most alluring places to visit. 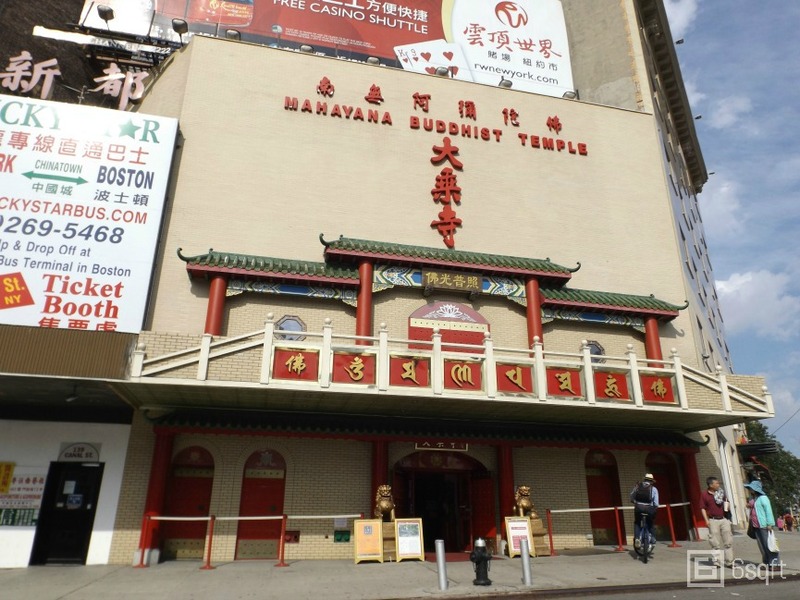 The temple, which is situated at 133 Canal Street, is the largest Buddhist temple in New York City. If you make your way deep into the back, you’ll find a 16-foot golden statue of the Buddha, also the largest in the city. The temple was erected in 1996 by the Eastern States Buddhist Temple of America, Inc. (ESBT). After building several other smaller temples around the city, one of ESBT’s co-founders, Annie Ying, saw that the many storefront temples in the city weren’t large enough to host functions for a substantial amount of people. Mrs. Ying had the temple completed just in time for the 83rd birthday of James Ying, her husband and ESBT’s other co-founder. 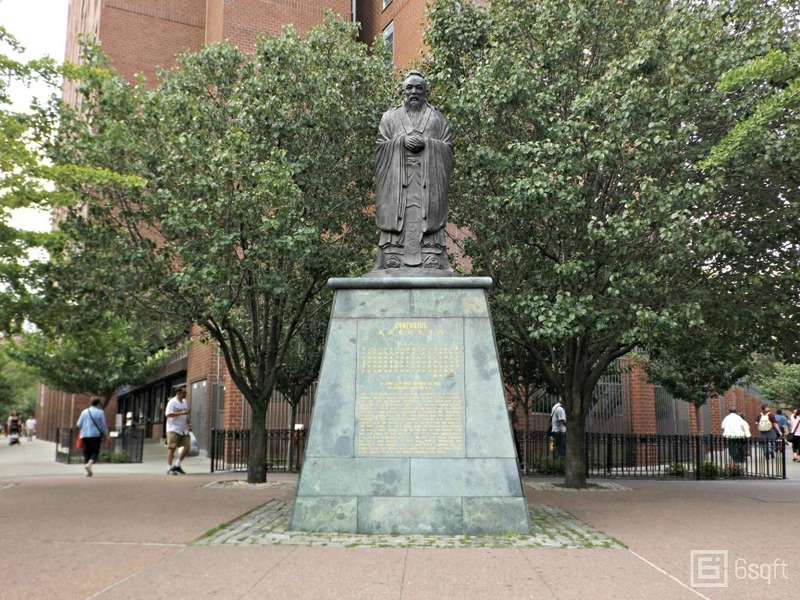 Columbus Park has been around since 1911, making it one of the city’s first major urban parks and the only public park in Chinatown. The park, designed by Calvert Vaux of Central Park Fame, was intended to bring “new life and order” to the depressing and dangerous Five Points area. It quickly became a place for people of all cultures and ages to gather. 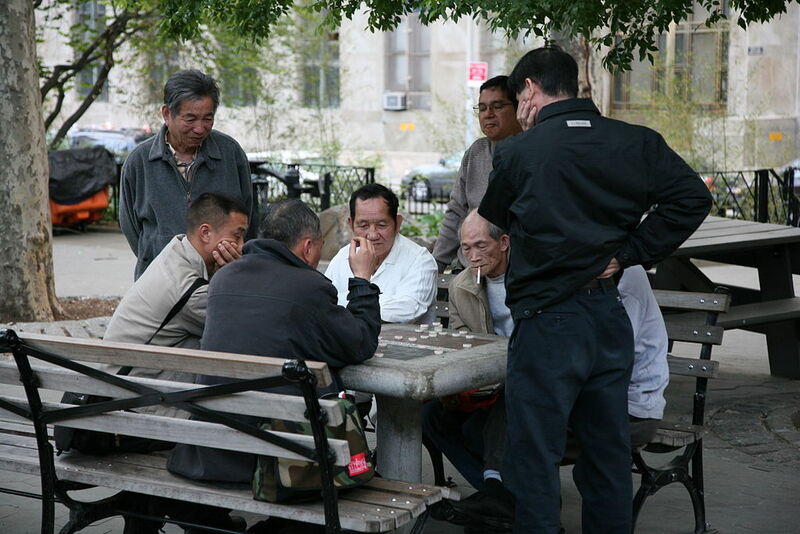 Today, you can go to Columbus Park and watch elderly people play boards games or practice tai chi, while the young folk take part in a rousing game of basketball. Many places in Chinatown claim to have the best soup dumplings, but Joe’s Shanghai has the awards to back it up. 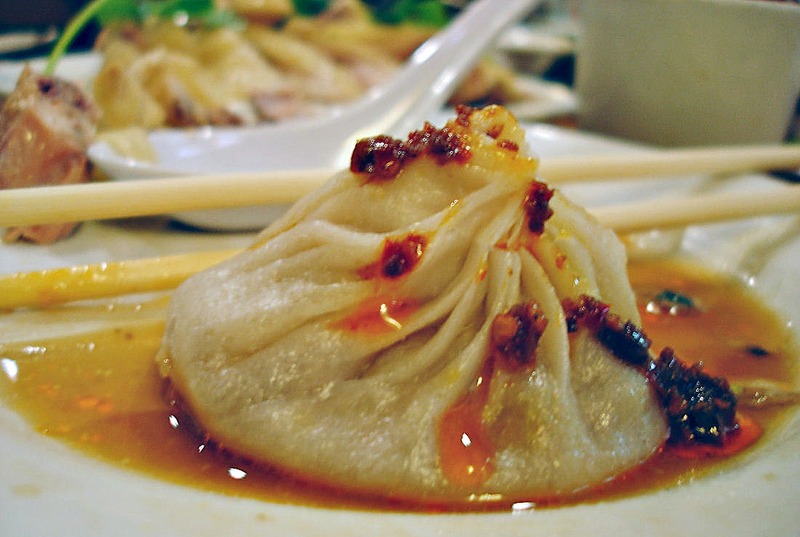 The restaurant has been in the dumpling business since 1995, when it opened its first store in Flushing. 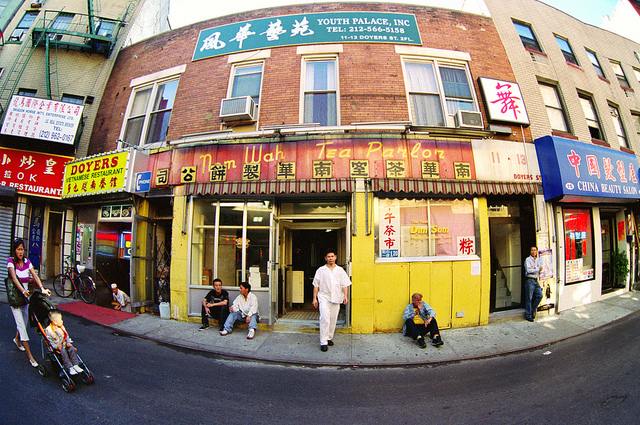 Its popularity quickly led it to open two more locations in Chinatown and Midtown and three in Japan. Crab and pork soup dumplings are Joe’s specialty, but people also rave about the spicy Szechuan style sliced beef, the crispy jumbo prawns with lime sauce, and the braised duck. 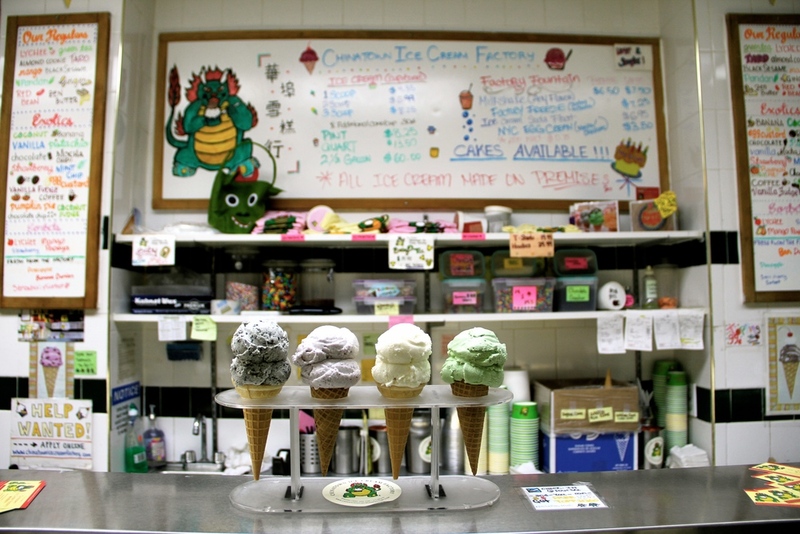 Chinatown Ice Cream Factory has been churning out delicious cones for over thirty years. What brings scores of people to the cramped shop on Bayard Street are the unique flavors. Here, traditional ice cream flavors are considered exotic, while flavors like lychee and don tot are listed as regular. Sesame seed ice cream is a crowd favorite, as is almond cookie and durian. The factory also regularly creates new flavors like honey lavender, jackfruit and lychee rose. 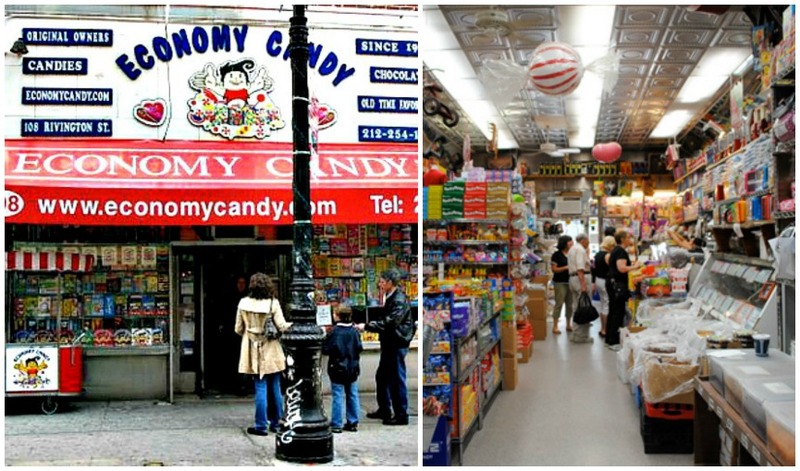 Economy Candy may have started off as a typical corner candy store, but after 78 years on the corner of Rivington and Essex Streets, it’s become a neighborhood staple. The candy store calls itself old-fashioned, but its ability to have something for everyone shows that it knows how to adapt with the times. At Economy Candy you can find old-time favorites, Kosher candy and nuts, and even “Harry Potter”-themed treats. The store has seen its share of hard times with the recent passing of founder Morris Cohen, but you can always count on Economy Candy to provide you with a sweet pick-me-up. Since the early 1970s, New Kam Man has served as Chinatown’s largest Asian supermarket. 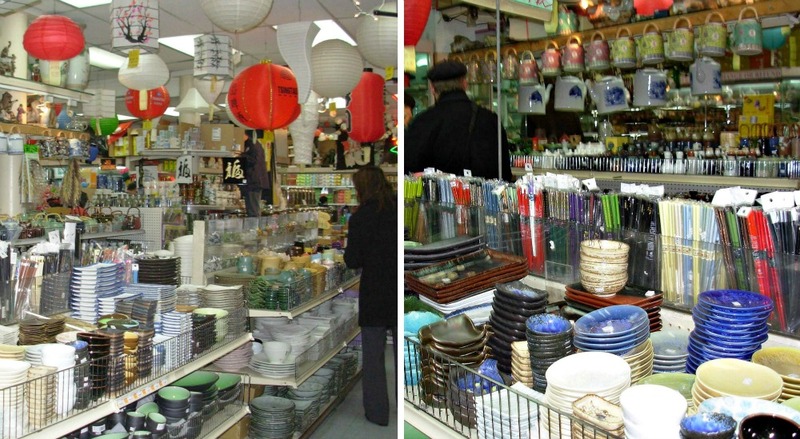 The store made it its mission to maintain the Chinese community’s link to its gastronomy heritage and to promote Asian food culture in general. Today, the market sells much more; within the multi-level store you can find diverse products such as black pearl face masks, handcrafted wooden chopsticks, and plenty of protective charm cats. 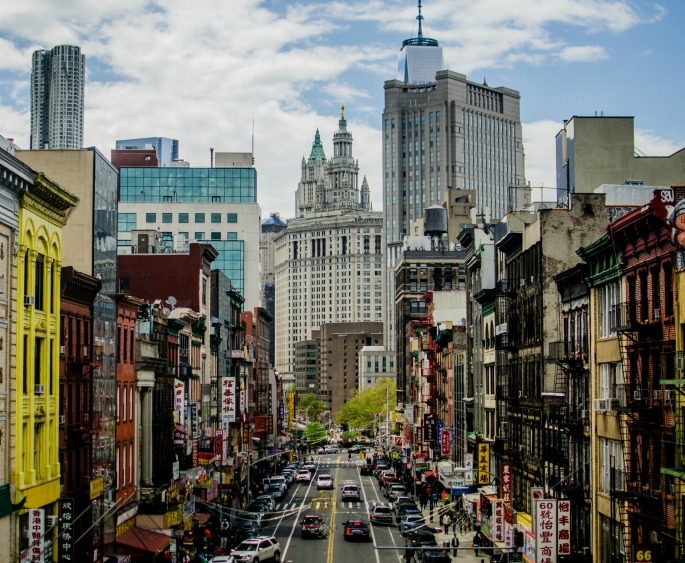 Looking down at Chinatown from the Manhattan Bridge, one building stands out among the colorful shops and signs–the mixed-use Confucius Plaza development, which, at 433 feet, is Chinatown’s tallest building. The 44-story complex houses 762 apartments, the Yung Wing Public School (P.S. 124), a daycare center, and various shops. But most visitors are there to meditate near the 15-foot statue of the tower’s namesake, the Chinese philosopher Confucius. Though the building itself isn’t beloved for its exterior features, the Confucius Plaza development is a source of neighborhood pride. In the early stages of its development, protests erupted over the lack of Asian American construction workers assigned to the project. In the end, over 40 Asian Americans were hired for the job, and the affordable housing nonprofit Asian Americans for Equality was created. 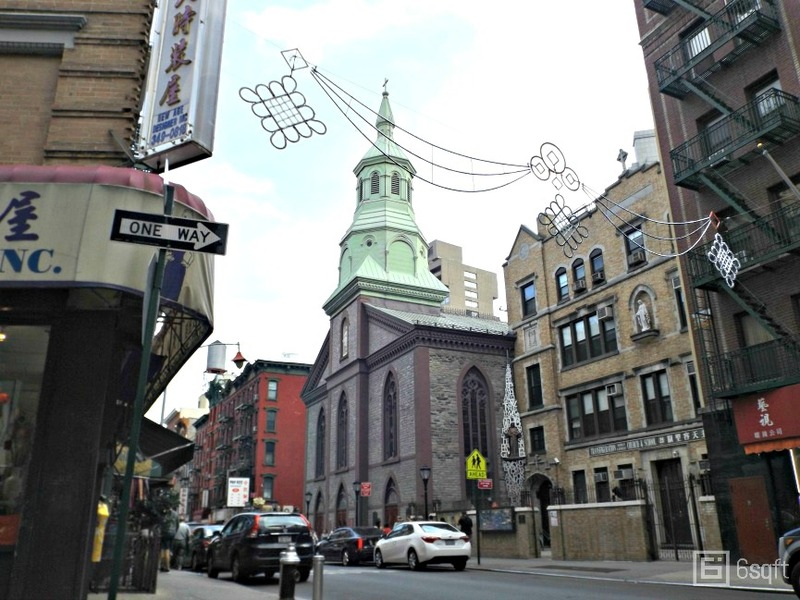 Another Chinatown standout is the Church of the Transfiguration, located at 29 Mott Street. First built in 1801, the structure is older than Chinatown itself, but it wasn’t always what it is today. The Roman Catholic Church of the Transfiguration started off as the Zion English Lutheran Church. After an en-masse conversion, it became known as the Zion Protestant Episcopal Church. It remained that way until 1815, when a fire gutted the church and ruined as many as 35 other buildings in the neighborhood. 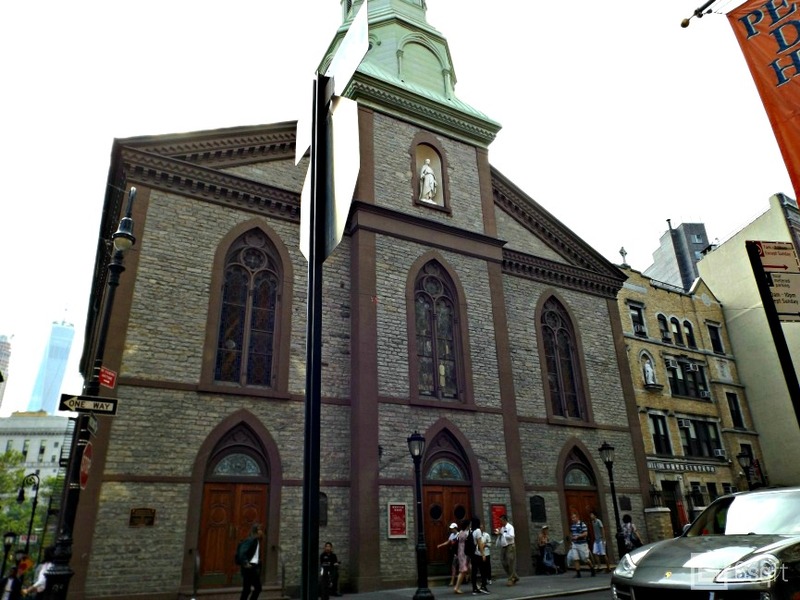 In 1853, the Episcopal congregation sold the building to the Roman Catholic parish of Fr. Félix Varela y Morales. For years the church was mostly of service to the Irish population in the area, but as the neighborhood’s demographic changed, it began to welcome Chinese residents. Today, the Church of the Transfiguration has truly become the heart of Chinatown, offering mass in English, Cantonese, and Mandarin, as well as other community-building services. Looking at this building on the corner of Mott and Canal Streets, you would think someone transplanted it right from ancient China. But in actuality, this building is homegrown and not nearly as ancient as its influences. The On Leong Tong building, also known as the Merchants’ Association building, was built in 1950 by Chinatown native Poy Gum Lee. Lee first made a name for himself as an architect in the Chinese cities of Shanghai and Nanjing; however, the Chinese Civil War forced him to return to New York. 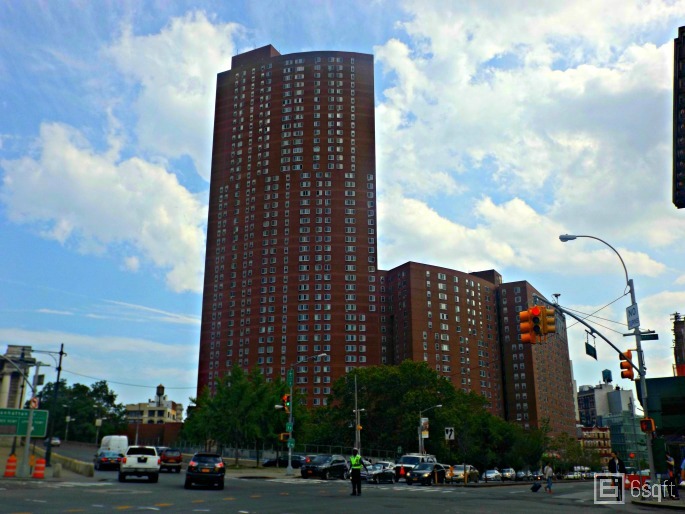 Lee then worked as an architectural consultant for the Chinese Consolidated Benevolent Association and served as a senior architect for the New York City Housing Authority. In addition to the On Leong Tong building, he created the Kimlau Square Arch, which memorializes the Chinese Americans who served in the military during World War II. In both this monument and the On Leong Tong building, Lee aimed to combine Western technology with traditional Chinese styles. What other places in Chinatown do you consider to be iconic? Let us know in the comments! Shouldn’t the CCBA building be considered iconic, given its central role as de facto neighborhood government liaison and community center for over 50 years?